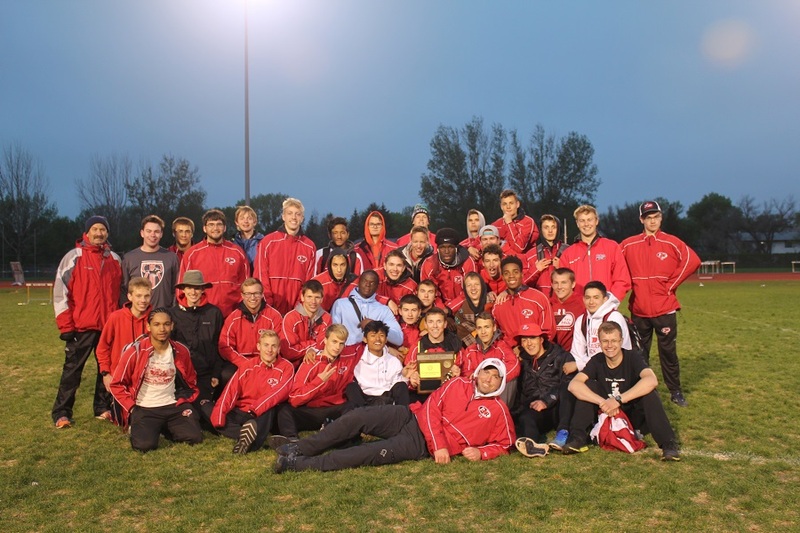 Under less than ideal conditions, the Red River boys finished third among all teams Saturday. Thunderstorms threatened most of the day but never materialized, leaving the meet cold and windy. The two-time defending champions scored 112.5 points, but it was not enough to match the overall depth of West Fargo (149 points) and the sprint strength of Fargo South (125 points). The big point scorer for the day was senior Tyler Burian, who collected 20.5 points in four events. Burian won the 200m (22.66), joining Ryan Todhunter (2009) as only the second RR athlete ever to win the East Region 200m Dash. He also placed second in the 100m in a photo finish (11.30). Exciting improvement was shown in the Riders’ sprint relays, with previously injured athletes Zack Topping and Thomas O’Halloran finally back to health. The results showed, as the team of Topping, Burian, O’Halloran, and George Nyanforh raced to a second place finish in the 4×200 (1:30.84). The 4×100 team of Topping, Burian, Ethan Brandvold, and Nyanforh placed 3rd (44.08). Both times are #6 in school history. Nyanforh (14.5 pts) was the other event champion, taking the triple jump crown on his last attempt (44’7). This is the third consecutive year a Roughrider athlete has won the East Region triple jump. Painter also had a great meet (15 pts), finishing second in the 300m hurdles in a PR time of 40.91, 5th in the 110m hurdles (16.09), 7th in the high jump (5’10), and running lead-off on the 5th place 4×400 relay team. Other members of that team included O’Halloran, Stoker Short, and Nyanforh (3:35.67). As they’ve done all season, the powerful javelin quartet of Seth Hanson (2nd-165’10), Brett Klefstad (3rd-159’3), Sam Schumacher (4th-159’2), and Liam Ogren (5th-159’1) provided big and crucial scoring. Their 23 points shot the Riders past Davies and North, who were right on the team’s heels prior to that event. New state qualifiers included senior Tim Dunham, who placed 5th in both the 1600m (4:37.70) and 3200m (10:08.90), and Bryce Enerson, who placed 6th in the 300m hurdles (42.68).